Join me mid/late April 2019 in South Dublin, Mount Merrion Community / Parish Centre, to learn more about healthy eating and good nutrition! Learn for yourself and those around you …. e.g. your family, partners, children, parents, other relatives and friends. 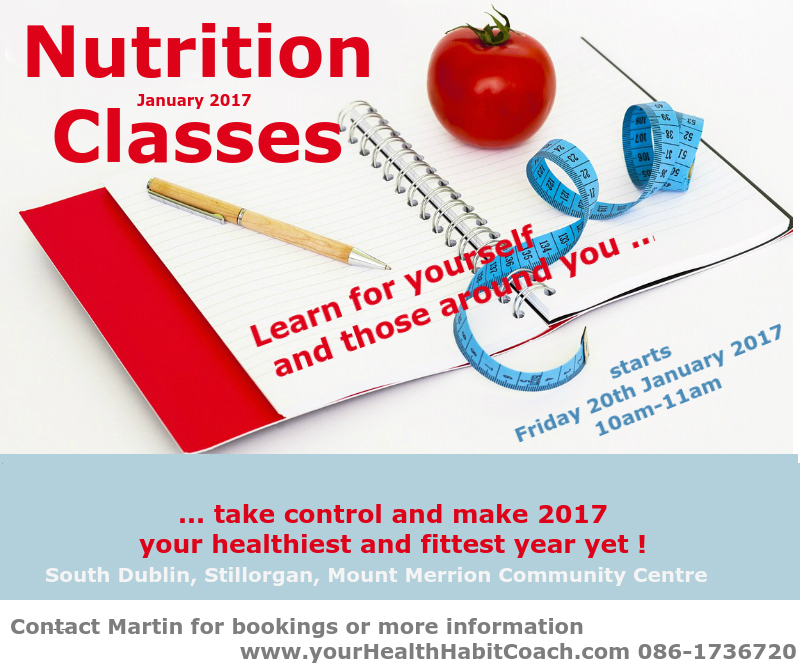 Spread the knowledge and allow yourself and others to be in better health, vital and fit – so you and others are better equipped to deal with nowadays fast paced and hectic life. (3) remove nutrition and food confusion that you might experience in a world where vested interests drive advertising and tries to make you believe certain foods are good and other foods are bad for you. Stillorgan, South Dublin, close to Blackrock, UCD, Goatstown, Dundrum. Price: €120 for 8 weeks. Places: limited to 15 participants, bookings are taken on a first come first serve basis. Why not come along with a friend and join together? We will dedicate time for general questions. You will get access to course-notes and handouts. Guidelines, Cheat Sheets, Book Recommendations and Tips will be provided. which will enable you to create lasting health habits. Habits from which you will benefit for a lifetime! with any questions you might have or to book your place. Places are limited. Read more about Martin’s professional background.